I tried the The Grand Alliance before my full tasting and after making a beeline straight from the office. 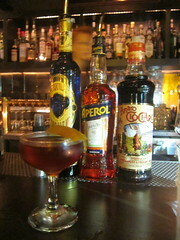 It was a perfect after-work, stirred drink, with Plymouth, Carpano, Campari and Maraschino. Negroni lovers will love this variation. Speaking of the classics, The Churchill Old Fashioned is not to be underestimated. This is because Mia’s ultra-secret mixture of bitters is the magic ingredient. As her (former) coworker and beau Rich mentioned, The Churchill is indeed lucky to have this one on their menu, as Mia has had her secret blend in the works for awhile and The Churchill is perfect for this Old Fashioned’s debut. The Grapes of Wrath is an outstanding pisco cocktail, made with Kappa, lime, pineapple, egg whites, bitters and cinnamon. With L.A. seeing more and more pisco on its cocktail menus, it’s nice to see a really well balanced drink made with the grape spirit. I appreciated the floral notes in this, which balanced out the slight sweetness. Enough with Pisco Sours! I didn’t expect to favor a tall rye drink, but there it is, the Rye 2 Ways. It’s available up (otherwise known as a Scofflaw) or with the all-favorite Allagash White beer, which is how we had it. I was surprised but realized how well the Belgian white, with its lemon and coriander, complemented the rye, which made for a well-balanced and refreshing beer cocktail overall. Taking the cake of the menu, though, was the Thirsty in LA – named after fellow cocktail blogger cohort Daniel. It is a delicious drink. An amaro-reposado tequila combination, the cocktail’s finishing touch was a mezcal rinse, which made for the perfect, slightly smoky touch. This fantastic, stirred cocktail had this savory-ness to its bitterness. So, so tasty, that Daniel need not worry he’s biased simply because it’s named after him – indeed it is a fantastic cocktail! Be sure to look at the entire menu for your other selections. Also recommended is Norman’s Cable Car, which is more to my liking than the original Sidecar – in part because maybe I’m more of a rum gal – and the cinnamon mixed in with the very small sugar rim was a nice touch. 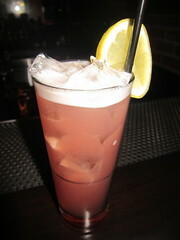 Rye 2 Ways: Bulleit Rye, dry vermouth, grenadine, lemon, up. Or add Allagash White for Fizzy & Tall. The Churchill, with this menu, ends up being the cocktail place on 3rd Street. Previously meant for brunch, lunch, tequila and shopping enthusiasts, 3rd Street now is holding its own for imbibers as well. I’ll see you at The Churchill, early and often! 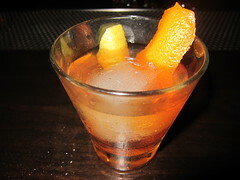 This entry was posted in cocktails, L.A., Mid-City West and tagged 3rd Street, bars, bartender, cocktails, L.A., Mia Sarazen, Mid-City West, mixology, Negroni, Old Fashioned, Orlando Hotel, Pisco, Sidecar, The Churchill. Bookmark the permalink.